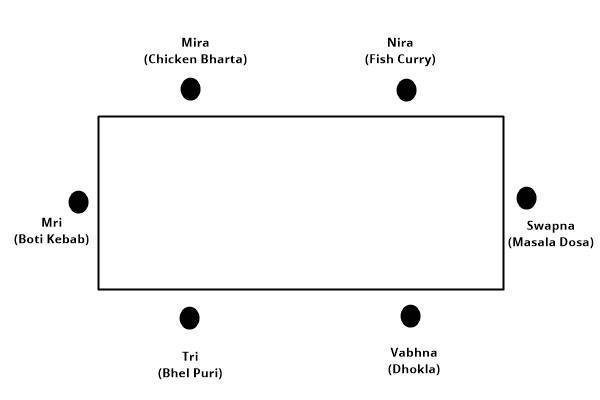 6 people: Vabhna, Tri, Nira, Mri, Swapna, Mira went to a restaurant and seated on a rectangular table and ordered for six different dishes:Bhel puri,Fish Curry,Boti Kabab, Dhokla, Chicken Bharta, Masala Dosa,but not necessarily in the same order. Maximum of them are facing the table. Two people are seating on each side of the table and one on each end. The person who is eating Dhokla is seating second to the right of Nira. Mri is seating opposite to the person who is eating Masala Dosa. Mira is facing the table and seating to the immediate left of the person who is eating Boti Kabab. The person who loves to eat Bhel Puri is seating between Mri and Vabhna. 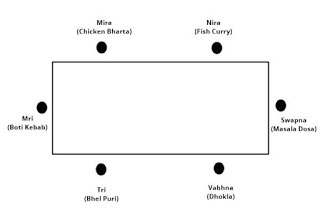 Swapna who loves to eat Masala Dosa is seating second to the left of the person who is eating Chicken Bharta. Swapna is seating alone. Tri is seating third to the left of Nira. There is no one seating between Nira and Swapna and the former is on the left of the later. 1. Who are facing outside of the table? 2. Who is eating Boti kabab? 3. Who is eating chicken Bharta? 4. Who is on the immediate left of Tri? 5. Who is eating Fish Curry? 6. Who is eating Dhokla? 7. Who is on the immediate right of Vabhna?